We care for your child’s dental needs from their first baby tooth until adulthood. Carousel Dental is conveniently located in the same office as our Pediatrics services, so families can schedule all their appointments in one visit, minimizing travel, time and stress. Many dentists only focus on a child’s permanent teeth, but neglected cavities, lost teeth or baby bottle tooth decay can lead to long-term dental and orthodontic problems. Studies show that children with healthy teeth tend to have improved school performance, better social relationships and fewer challenges later in life. Dental treatments include sealants, composites and fillings, crowns and spacers for lost or missing teeth. Developing good habits early on can help young children and parents avoid future dental problems. Led by Board-Certified Dental Director, Dr. David R. Jones, Carousel’s pediatric dental services are designed to deliver the best possible care in a comfortable, kid-friendly setting. We serve private pay patients and patients on Medicaid. 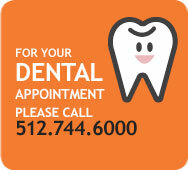 Contact us if you have any questions regarding Carousel's Dental services.